Local shares and their regional peers shrugged off last Friday's steep losses in Wall Street yesterday. 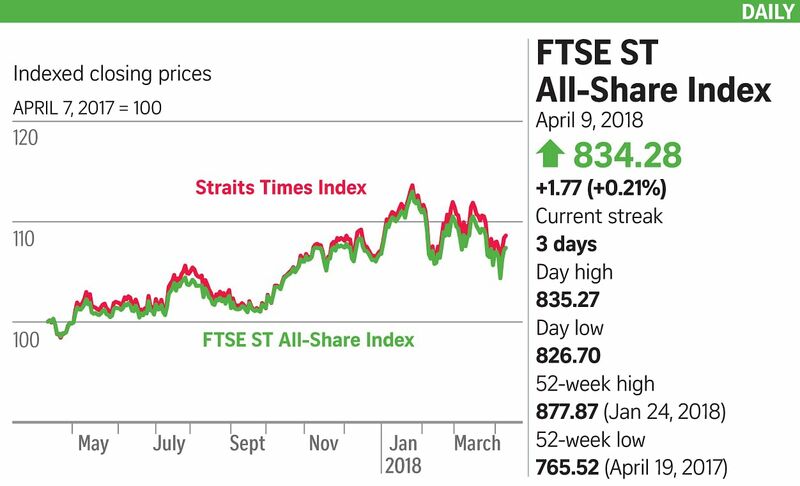 The Straits Times Index (STI) advanced 7.46 points, or 0.22 per cent, to 3,449.96 alongside gains in other key regional indices including China, Japan, Hong Kong, Australia and Malaysia. Last Friday's falls of around 2 per cent - one of the biggest single-day losses this year - in the three main US indices were led by concerns over a US-China tug of war over trade and misses in US jobs data. Traders will closely watch if the US is adamant on imposing tariffs on an additional US$100 billion (S$132 billion) in Chinese imports and how China will retaliate. "With President Xi Jinping due to speak on Tuesday morning at the Boao forum, the attention will be on the Chinese leader for his views towards the latest trade skirmish," said IG Markets analyst Pan Jingyi. "Investors are bracing themselves for a retaliation... that could keep markets on edge." Even so, on the back of the synchronised growth in the global economy and tax cuts in the US, Citi Research said it expects an 8 per cent rise in global equities by the year end, so the recent pullback may be a chance for investors to buy on dips. It said the major risk to its view that could trigger a bear market is a cyclical slowdown in growth, a policy breakdown in the US, which is anything but far-fetched, or a sharp turnaround in the dollar. Phillip Capital said that while risk aversion has dragged the STI into a prolonged correction that began in January, the long-term uptrend remained intact. Turnover here came in at 1.95 billion shares worth $1.2 billion with gainers trouncing losers 249 to 165. Gains were led by Singapore's three banking juggernauts with DBS Group Holdings up 0.5 per cent to $27.80, United Overseas Bank ahead 1 per cent to $27.65, and OCBC Bank advancing 0.3 per cent to $12.80. KrisEnergy jumped 0.9 cent, or nearly 10 per cent, to 10.2 cents and was the day's third-most active with about 64 million shares worth $6.5 million done. Keppel Corp, which is a controlling shareholder of KrisEnergy, said yesterday that it has inked a cooperation agreement with the firm to be appointed preferred contractor. Kingboard Copper Foil Holdings surged seven cents, or 18.4 per cent, to 45 cents, with 41 million shares worth $18 million exchanging hands. The sharp swing prompted an unusual trading activity query from the Singapore Exchange.